1/1, July 1896-June 1897. 15 M., 16 pp. 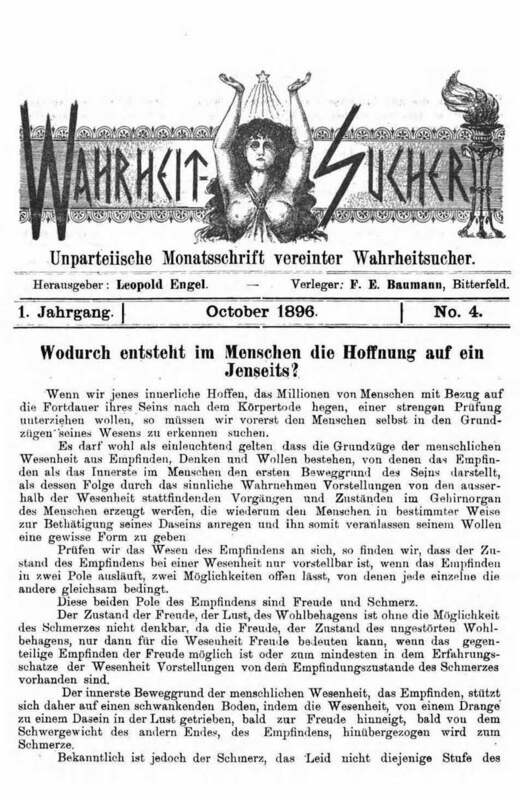 This was one of the participants of the III Kongress Deutscher Okkultisten in 1896, and the journal advertised in the Stenographischer Bericht of the congress. 4 Marks a year. It was said to be "im engsten Verbande" with the Internationales Addres-Buch vereinter Wahrheits-Sucher, an occult and spiritualist almanac also edited by Engel. The plan was that this journal would provide monthly updates on the doings of occultists and spiritualists and that these would then be collected in an annual revision of the Addres-Buch. A discount was given for those subscribing to both. The idea didn't work out and the journal was little more than a review of Theosophical and occult doings in Germany, with various original articles on general occult subjects, and was merged into Engel's Das Wort after one year. Extensive advertisements for the works and journals of P. Braun, J.H. Dewey, ZDB: Halle/S UuLB. ; Harvard University.